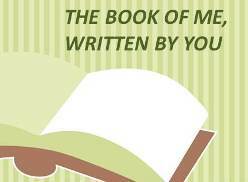 The Book of Me Written By Me is more pathetic than ever. The bloom is off the rose. My fault entirely, of course: lack of commitment, a preference to pick and choose, too many eclectic pursuits, creative excuses like I have to clean my kitchen or my hard drive crashed, and so on. Diaries and Journals (Prompt 6) are something I gave up on — apart from travel journals and boring attempts to track medical-health issues — because Facebook appeared and it has a lot of leniency for recording the important, exhausting trivia of daily life. My Latvian Grandparents (Prompt 7) have been written into posts on this blog; my Scots-descended Grandparents whom I never knew personally are admittedly a bit neglected. No-one has yet pressed me to hear about Will's gentle decline into depression after his brother got run over by a train, a brother who may or may not have ruined the family business. A Time Capsule (Prompt 8)is simply not big enough to hold (I should say choose) a few treasures or cryptic artifacts. A memo attached to my will that lists the family heirlooms (few) and personal treasures (many) including provenance for all is quite enough to gobsmack my kids. Halloween (Prompt 9) and sticky little children I avoid at all costs but do pay due respect to All Saints Day and All Souls Day. Can't recall offhand any Unexplained Memories (Prompt 10) but would this count? 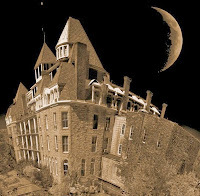 An old recurring dream about being shot in the spine has since been replaced by being lost in a huge hotel — make of that what you will, Dr. Freud. Good! That moves us right along to Military (Prompt 11). And like many Geneabloggers, I did a post for the eleventh day of the eleventh month. In fact it's sitting right below this one. In my families, there's a certain dearth of eligible ancestors and collaterals in the military category. Why? — there we go, another adjunct idea to mess around with. In future, applying myself better would be worthy of all those others who are creating such interesting posts. Now, faithful reader, you will find a hiatus here until the festive season is truly cranked up to Code Green levels. I'm just taking my fest a bit early and away. A German, if asked, might know Holzminden as a pretty little town on the Weser River in Lower Saxony. The name might have an entirely different context for an Englishman, an Australian, a Canadian, and others. Today's town seems to function without conscious memory of its own history a "mere" century ago. Ninety-five years ago my father Lt. Hector Dougall and his colleagues in Holzminden Prisoner of War (POW) Camp received the news of Armistice Day (more on Hector's escapades here). The camp inmates in 1917-1918 were captured Allied officers with some enlisted men as orderlies. 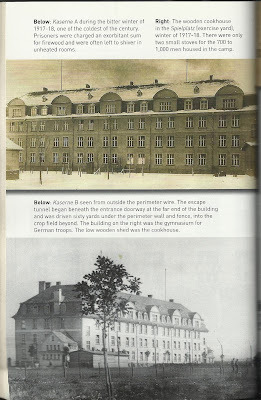 In 2013 when we asked a few residents of the town about the old camp buildings and their First World War role, they were bewildered; shared memory seemed barely to encompass the Second World War. The daring (and later celebrated) wartime escape of 1918 in their midst was not on their radar. The buildings housing the prisoners were constructed as army barracks in 1913 and still exist today, above the town, as part of a German military base. 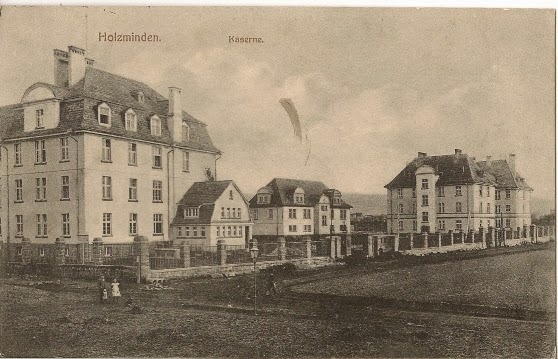 Holzminden was deemed a punishment camp for rebellious prisoners, repetitively described as the "most notorious" of First World War prison camps ― the German Black Hole, as Hanson mentions. Its notoriety was due to the strictest of controls and the reputation of the bullying, brutal, temperamental Kommandant: Hauptmann Karl Niemeyer. The camp conditions may pale in view of later conflicts, but this was probably the last great war of traditional military manners when officers of opposing forces gave due respect to rank. However, Niemeyer flouted the Hague Conventions, treating the men contemptuously as criminals, verbally and physically. Escape attempts were punished with solitary confinement for arbitrary, long periods, disgusting food rations, and denial of medical aid. Real or perceived infractions incurred deprivation and standing for hours in freezing weather. Red Cross parcels and packages from home were pilfered or even withheld. Sometimes Niemeyer ordered the guards to shoot randomly into the prisoners' quarters. The facilities were sorely inadequate for the numbers of incarcerated, so prisoners were usually cold and hungry; by all accounts, there was never enough food and much of what there was, was inedible. In winter, six hundred men shared three stoves for heat. Judging from their personal diary excerpts, the prisoners for the most part exhibited the plucky, stiff upper lip syndrome and a sense of humour in foul conditions. They mocked and defied Niemeyer whenever possible. Under his very nose the men of Kaserne B dug their incredible escape tunnel. The epic project was well-documented by a participant: the meticulous planning; the inventive details; the coordination; the patience; the courage. Twenty-nine men escaped before the tunnel collapsed, leaving a disappointed waiting lineup and the rest of the camp to face Niemeyer's apoplectic, vindictive anger. Eventually nineteen men were recaptured in a great manhunt effort. They were held in solitary confinement until a court-martial was arranged; fortunately the turning tide of war prevented enforcement of their sentencing. Niemeyer has been widely demonized as a dangerous, self-aggrandizing buffoon. His own guards feared and despised him to the extent that some collaborated with the prisoners. When word of the Armistice came, he disappeared; some say he donned a disguise to avoid facing Allied troops. That last month of November into December, the guards also trickled away to be replaced by German soldiers. Both captors and prisoners were ill at ease as political turmoil reigned among the defeated population. Lack of food was an even more serious issue for everyone, including civilians. Time seemed to drag on forever for the weary POWs whose collective expectation of repatriation was dashed several times in the general confusion and logistics failures. It took another month until a train was finally arranged to transfer the men from Holzminden to the Dutch border. As if in a dream come true, hundreds of weakened servicemen were proceeding back to "Blighty." Niemeyer's later whereabouts are unknown: myths arose about "sightings" to feed the fantasies of would-be bounty hunters. Maybe we are all guilty of collective memory deficit. As the twentieth century rolled on, the evolution of broadcast media and film created modern, indelible wartime images in the public eye. The Second World War and further conflicts became more immediate and visual. Most of us remember Steve McQueen in the movie "The Great Escape," right? And so the original Great Escape was eclipsed. But now the exciting, gratifying news. The lengthy project called Faces of Holzminden has identified over 500 Allied war prisoners who were "guests" in that camp. This month it gave birth to the Random House (Australia) publication The Real Great Escape (see also the dedicated Facebook page). I rather regret the new title ― it lacks the emotional pull for those of us descendants heavily involved with author Jacqueline Cook ― but marketing wisdom prevailed. Publication coincides with world-wide First World War commemorations. The tunnel story has been told before. Half the book dwells on it while the rest pays attention to the flesh-and-blood men. 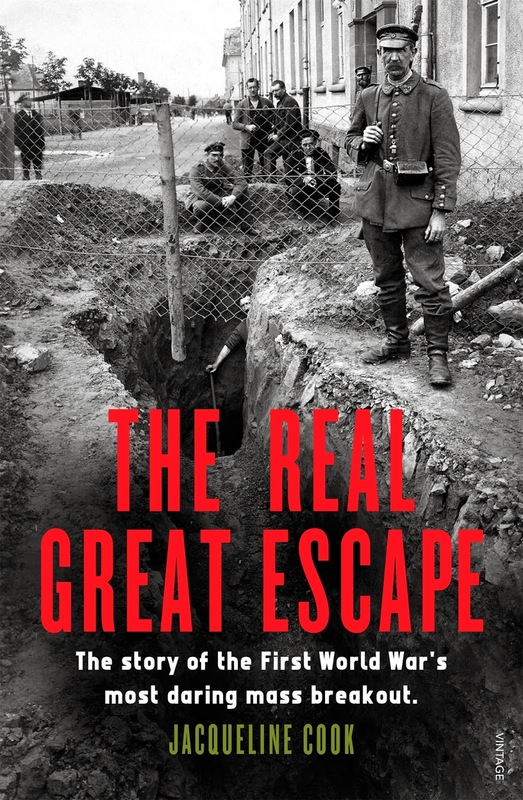 To my mind, what distinguishes The Real Great Escape is the generous usage of many prisoners' personal wartime diaries, most of them shared for the first time in public. Daily life in the camp becomes real through their comments, reactions, and struggles. Thanks to the warmly extended interest of Cook and her colleagues, we descendants became a cohesive resource group. It was especially rewarding to make contact with grandchildren of the man whose life Hector once saved. Hector was not involved in the tunnel operation; due to previous escape attempts he was originally assigned to long weeks of solitary confinement in the wretched basement cells of Kaserne A. 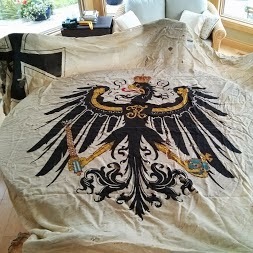 He came home to Canada in 1919 clutching the enormous flag he had jubilantly "liberated" after a crazy climb up the camp flagpole. Some of his diary thoughts appear in The Real Great Escape. Like all the soldiers, sailors, and airmen who preceded and followed them, these were once lively young men whose war experience would remain with them and affect them to different degrees throughout their futures. We lost a great many of them. There are many stories about the Great War. Lest we forget. Neil Hanson, Escape from Germany (London: Doubleday, 2011), 32. Jacqueline, Cook, The Real Great Escape (Australia: Random House, 2013), 28. (http://www.merredinmercury.com.au/news/local/news/general/the-great-escape/283988.aspx?storypage=2 : accessed 16 August 2013). Hugh Durnford, The Tunnellers of Holzminden (UK: Cambridge University Press, 1920). Jacqueline Cook, The Real Great Escape (North Sydney: Random House Australia, 2013). One of those chance things you come upon that distract you far away in time and place. The Leonids meteor shower is an annual event that is greatly enhanced every 33 years or so by the appearance of the comet Tempel-Tuttle. When the comet returns, the Leonids can produce rates of up to several thousand meteors per hour that can light up the sky on a clear night. Douglass witnessed one such manifestation of the Leonids shower, and the subsequent return of the comet Tempel-Tuttle in 1833 is credited as inspiring the first organized study of meteor astronomy. 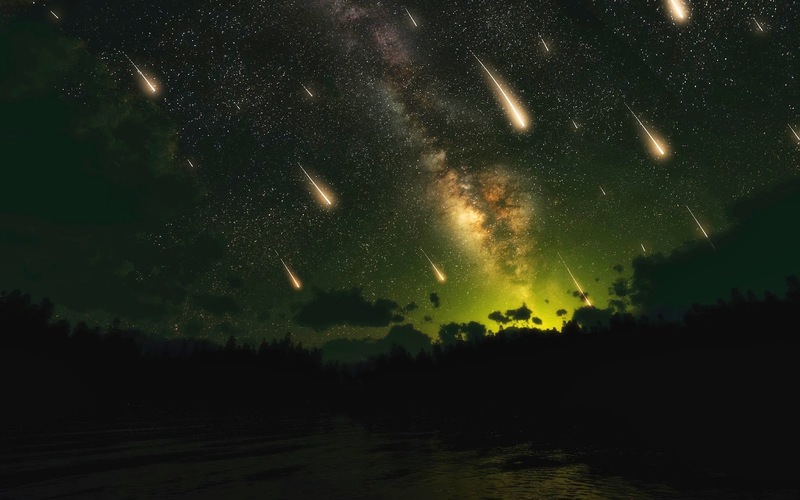 As we know, spectacular meteor showers are not everyday happenings. The largest ones can more or less be predicted and measured every thirty-odd years, thus the flurry of popular interest when celestials align. November is usually the time of year for watching. We are so sophisticated now we do not fear that the sky is falling. We can share the Spencers' childish rapture at nature's dazzling cosmic display. You can bet they remembered it all their days and obviously passed the story on. (1) Eugene O'Leary, "Notes on the Spencer Family," 15 May 1914; Toronto Branch, United Empire Loyalists' Association of Canada (UELAC), Accession Box 994.005.1, File 16, Correspondence January-June 1914. (2) "First Meteor Shower on Record," This Day in History (http://www.history.com/this-day-in-history/first-meteor-shower-on-record : accessed 20 March 2013). (3) Joe Rao, "The Night the Stars Fell," Illinois Genealogy Trails History Group (http://genealogytrails.com/ill/stars.htm : accessed 20 March 2013); originally from Sky and Telescope Magazine, 1998.